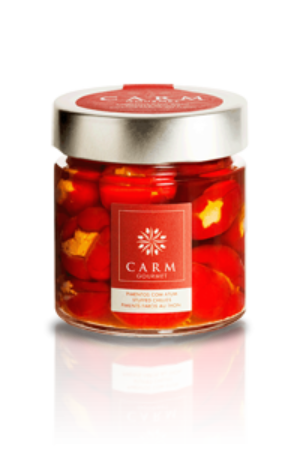 We selected one of CARM’s more mature olive oils to make these heart-shaped slightly spicy, tuna stuffed, red peppers. In the picking of these peppers, between September and October, only the peppers with the desired dimensions are selected and brined. The peppers are then cored, suitably drained, washed and stuffed with a very delicate tuna belly. These tuna stuffed peppers with a refined Mediterranean flavor are excellent as a simple starter or accompaniment with a salad.